The high quality of the STOL CH 701 design and kit assures you that this is one project you'll be proud to own and fly for many years. Building your own aircraft is going to be one of the most challenging and rewarding undertakings you'll ever accomplish: imagine, you'll be enjoying the thrills of flying an aircraft that you've built yourself! Few people get to experience the sensation and freedom of flying. Even fewer are also rewarded by flying an airplane that they've built themselves. The STOL CH 701 will help you realize your dreams like no other kit aircraft! NEW updated CAD Drawings and Photo Assembly Manuals. Detailed blueprints of the complete airframe and components (CAD drawings), supplied with aircraft serial number: All you need to ‘scratch-build’ the STOL CH 701. The Assembly Manuals are supplied on CD-ROM, with high-resolution Photo Assembly Guides. Plans and manual are included with the airframe kit. Add $15.00 for overseas Air Mail shipping. The STOL CH 701 airframe kit comes with all kit parts to build the airframe: The kit includes the factory riveted wing spars, pre-formed sheet-metal parts (ribs, skins, etc. ), factory-welded parts, standard fuel system (welded aluminum wing tanks), controls, and hardware required for assembly of the airframe. Most skins are now supplied CNC pre-cut and pre-drilled! The kit includes the Drawings and Manuals. The Finishing Kit includes the items to complete the aircraft, including the All-Terrain Gear and wheels with hydraulic disk brakes, the formed plexiglass windshield, “swing-up” doors, seat belts, wing struts, hardware, and more. Developed and tested by Zenith specifically for the STOL CH 701, the new Rotax 912 ULS firewall-forward powerplant package includes the Rotax 912 ULS engine (100-HP, four cycle, dual ignition), plus accessories: engine mount (new rear ring style mount for smoother operation), vibration dampeners, stainless steel exhaust system, new 'easy-access' fiberglass engine cowl, radiator cooling system, oil reservoir, dual carburetors, Warp Drive three-blade ground-adjustable propeller, engine controls, battery box, key & ignition, hardware and Rotax installation and operating manuals. Battery not included. The Instruments Package includes all the basic flight instruments and engine gauges for the Rotax 912 powerplant: Airspeed, Ball, Magnetic Compass, Altimeter, Tachometer (RPM), Oil Temperature & Pressure, Coolant Temperature, Voltage Indicator & Hourmeter. Accessories included. Click here for additional details about the Rotax 912S. The new Rotax 912iS firewall-forward powerplant package includes the Rotax 912iS engine (100-HP, four cycle, dual ignition), plus accessories: engine mount (rear ring style mount for smoother operation), vibration dampeners, stainless steel exhaust system, 'easy-access' fiberglass engine cowl, radiator cooling system, oil reservoir, dual carburetors, Warp Drive three-blade ground-adjustable propeller, engine controls, battery box, key & ignition, hardware and Rotax installation and operating manuals. Battery not included. Click here for additional details about the Rotax 912iS. Rotax 912iS Aircraft Engine (as supplied by Rotax) and Rotax Engine Installation Package Zenair Ltd. Developed and tested by Zenith specifically for the STOL CH 701, the 'firewall-forward' powerplant package includes the Rotax 912 engine (80-HP, four cycle, dual ignition), plus accessories: engine mount, vibration dampeners, stainless steel exhaust system, 'easy-access' fiberglass engine cowl, radiator cooling system, oil reservoir, dual carburetors, three-blade ground-adjustable GSC propeller, engine controls, key & ignition, hardware and Rotax installation and operating manuals. Battery not included. 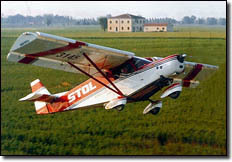 Click here for additional details about the Rotax 912. Thanks to the long list of standard equipment included in the kit, there are few additional options needed or recommended. Order the following kit options when ordering the kit or component kit to install when building the aircraft, unless specified as a retrofit. Prices for the OPTIONS drawings-only are $25.00 each unless otherwise specified. Formed acrylic bubble door to maximize cabin width and visibility, with composite door frame. Price shown for pair. Note: This is an upgrade kit and replaces the standard doors. Door hardware is included with fuselage kit. Replaces the standard two-position handle, adding more flaperon positions and making the handle easier to operate. Upgrade the standard steel tube wing struts with extruded aluminum streamline struts. Price shown is the upgrade price. If ordered separately, price is $1,075 for the option kit. Responsive electric trim tab on elevator, actuated by rocker switch on panel. Includes installation instructions, mounting hardware, and panel-mounted trim position indicator. AeroLED: Super-bright landing light mounts inside the wing leading edge slat. Introductory Price. Available as retrofit. This kit option increases the size of the standard fuel tanks to approximately 12.5 U.S. Gallons (48 liters), replacing the standard 10 U.S. Gallons (38 liters) fuel tanks. This kit option maximizes the fuel capacity of the aircraft by doubling up the number of standard fuel tanks to two tanks per wing. One Box, approx. 12.25' x 4' x 3', 850 lbs. Prices in U.S. funds. All prices, equipment and availability subject to change without prior notice. Prices do not include crating or shipping charges (FOB Factory). We restructured our STOL CH 701 kit into two basic packages: The Airframe Kit and the Finishing Kit. This allows us to offer a lower cost basic airframe kit, while also allowing builders to buy the Finishing Kit later on when they need it to complete the aircraft.